Christmastime is renowned for its sweets. Iced sugar cookies, homemade caramels and chocolates. What if the people in your life aren’t into sweet, but savory treats? 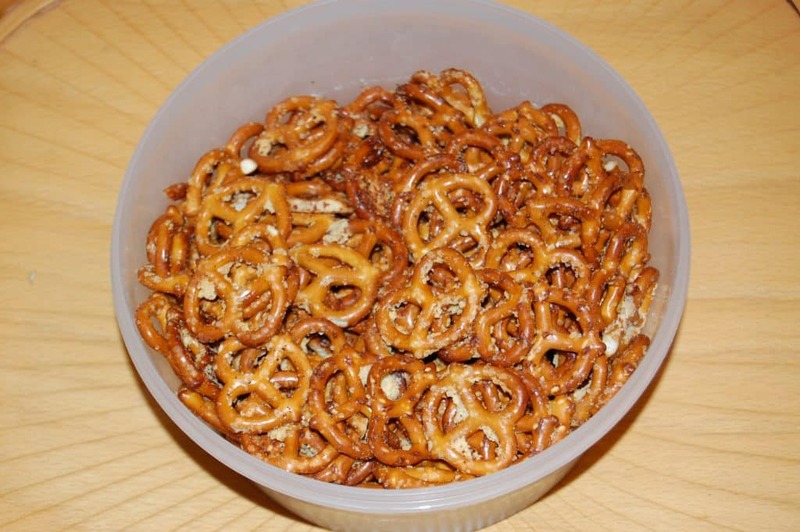 This easy to make salty snack is perfect for them. Today’s experiment: Garlic Pretzels. I love an easy recipe and this one takes the cake. It has a delightful taste with minimal effort. My husband and I made them look extra fancy by putting them into cellophane bags (100 for 3 dollars at Wal-Mart, down the wedding aisle). We decided not to, but you could easily affix a festive ribbon or bow over the tie to make them that much more pleasing to the eye. Melt the butter. Stir in the garlic powder and parmesan cheese. Toss your pretzels into a large roasting pan. Pour the butter mixture over the pretzels. Bake at 325 degrees F for 12-15 minutes, enough for the butter mixture to bake on but just before they get burnt. Stir the pretzels often with a long-handled wooden spoon so that none of them get too crispy, stuck at the bottom of the pan. Remove and enjoy once cooled. Oh, yes, so easy! We only made a third of this recipe, using one bag of pretzels. I have to tell you, we were overflowing with pretzels. Well, one pound of pretzels to be exact. It was enough to fill six cellophane bags and have plenty for me to snack on the whole week before we gave them away. 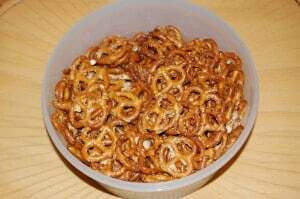 I think you could use this recipe to make pretzels any way that you want them. You could ditch the savory idea and go with butter, sugar and cinnamon. Or you could try other savory pairings. Olive oil, rosemary and black pepper. Coconut oil, curry powder and sea salt. Or ditch baking it altogether. Make a traditional “trail mix” by adding M&Ms, shelled peanuts and raisins. Make a fancypants mix with white chocolate chips, almonds, and dried cranberries. I know my husband would love the pretzels paired with peanut butter chocolate chips and semisweet chocolate chips. This is just the beginning of what you could do to spice up a pretzel gift. Let the creativity flow! Use what you find in your cabinets. Please share your ideas with everyone else by writing them in the comment section below.